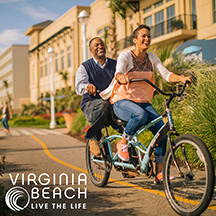 Get ready to Shamrock your way throughout Virginia Beach, where ocean breezes cheer you on in all you do. Whether you hike a park trail, bike the boardwalk, kayak a quiet waterway, stand-up paddle or recharge by the shore with a seafood feast and a cold one, you deserve to Live the Life. iFLY is where the dream of flight becomes reality. Located right in the heart of the Virginia Beach oceanfront, iFLY Virginia Beach welcomes flyers from 3 to 103! When you come to iFLY get ready to be blown away – literally. It’s thrilling. It’s amazing. Experience the feeling of freefall as you float on a smooth cushion of air. There’s no parachute, no jumping, and nothing attaching you to planet Earth. It’s just you FLYING in the air. Super fun, super safe and super cool! Learn more today!